One of the most controversial issues in the nutrition community is whether milk consumption is healthy or an agent of disease. And what if you have diabetes – should you steer clear of milk? Short answer: it depends. This article will help you determine whether to consume milk or not and how to make the best choices if you decide to include dairy products in your diet. Before we get started on the factors to consider before consuming milk, it can help to understand the composition of milk. In a nutshell, cow’s milk contains water and about 3 to 4% of fat, 3.5% of protein, 5% of a natural sugar called lactose as well as various minerals and vitamins. The following table shows the nutritional composition of various types of milk. As you can see from the table above, compared to human milk, animal milk contains a significantly higher amount of protein. That’s because calves need to grow much faster than babies and thus require much more protein. Is consuming milk from another species an issue? Keep reading to find out. Milk consumption and Type 1 diabetes – is there a link? There have been some controversial studies that have associated cow’s milk consumption with juvenile onset diabetes, more commonly known as type 1 diabetes. Scientists have found that the protein composition of cow’s milk, especially the A1 beta-casein molecule, is radically different from that of human milk and can be extremely hard to digest for humans. Although more research is needed, studies suggest that this A1 beta-casein along with bovine insulin present in cow’s milk can trigger an autoimmune reaction in genetically susceptible children who have a particular HLA (human leukocyte antigen) complex. This autoimmune reaction causes the body to produce antibodies against the beta-cells – the cells that produce insulin the pancreas – gradually destroying these cells and paving the way for type 1 diabetes. Bottom line: If possible, mothers should try to exclusively breastfeed their babies until their first birthday at least. Milk consumption and Type 2 diabetes – is there a link? You might be surprised to know that a review of 16 studies suggest that full-fat milk can actually protect against diabetes, obesity and heart disease. It appears that trans-palmitoleic acid (a fatty acid found in milk fat) can improve insulin levels as well as insulin sensitivity. In fact, in one study, participants with the highest levels of trans-palmitoleic acid in their blood had a whopping 60% lower risk of developing diabetes compared to those with the lowest levels. Moreover, the fat in milk products also contains butyrate which is known to not only improve the gut flora but also inhibit inflammation which has been associated with the development of chronic diseases such as diabetes and heart diseases. Phytanic acid, another fatty acid present in dairy fat, and conjugated linolenic acid (CLA), a natural trans fat in milk, have also been found to reduce the risk of diabetes, heart disease and cancer. Researchers have found that camel milk contains an insulin-like protein that is able to withstand gastric acid, enabling efficient absorption in the bloodstream. As such, consumption of camel milk can help improve blood glucose levels – in one study involving patients with type 1 diabetes, researchers found that drinking camel milk daily helped the patients reduce their insulin requirements by 30%! Moreover, camel milk is also a rich source of the mineral zinc which is involved in insulin production by the beta-cells. Bottom line: Dairy fat can help protect against diabetes but this doesn’t mean you should start consuming dairy products if you don’t already. What this implies is that you would greatly benefit from switching from low-fat or skim milk to full fat milk. Can you drink milk if you have diabetes? The prevalence of milk allergies during infancy ranges from 1.9% to 4.9% but this drops to 0.1 to 0.5% during adulthood, suggesting that many outgrow the allergy. Did you know that up to 65% of the world’s population suffers from lactose intolerance, a condition that causes digestive distress and diarrhea? The main reason so many individuals have difficulties digesting dairy products is that they lack the enzyme lactase which is needed to break down the milk sugar lactose in the gut. This being said, it is possible to cure lactose intolerance although this is beyond the scope of this article. In the meantime, you may want to try fermenting milk to make kefir or yogurt – these are lower in lactose and are usually well tolerated by those who are lactose intolerant. Lactose-free or reduced lactose milks are often recommended to individuals who are lactose intolerant. However, from professional experience, individuals with diabetes or insulin resistance (as in PCOS) tend to experience spikes in their blood glucose levels when they consume these types of milk. If you still want to consume these milks, make sure to check your blood glucose levels prior to consumption and about 30 minutes afterwards – this will help you determine the effect these milks have on your blood glucose levels. Do you suffer from increased intestinal permeability? When the intestinal lining is damaged, the tight junctions between the intestinal wall and the bloodstream can no longer prevent incompletely digested proteins, bacteria or bacterial fragments from leaking out into the bloodstream. When these substances reach the bloodstream, they trigger the immune system and can send it into overdrive. It is possible that the immune system will also respond to potential allergens found in milk such as alpha-casein, beta-casein, butyrophilin and casamorphin. For this reason, individuals with a compromised intestinal lining will probably have adverse reactions such as bloating, diarrhea and heartburn if they consume milk. Gluten is a protein found in wheat, rye, barley and triticale. From professional experience, individuals who react to gluten (such as experiencing heartburn, feeling bloated or suffering from joint pain after consuming foods that contain gluten), will often also react to milk. That’s usually because gluten intolerance usually impairs gut health and usually leads to increased intestinal permeability. As the name suggests, small intestinal bacterial overgrowth refers to an excessive multiplication of bacteria in the small intestine – this is one of the main causes of irritable bowel syndrome (IBS). Individuals with the condition may react to milk since the bugs in their intestines will happily feast on and ferment the lactose in milk, causing gastrointestinal issues such as diarrhea, gas and bloating. Do your blood glucose levels spike after drinking milk? The best way to find out is to check your blood glucose levels prior to consuming milk and about 30 minutes afterwards. As you might have guessed, avoiding milk is a good idea if you suffer from milk allergies, severe lactose intolerance, gluten sensitivity, if your blood glucose levels rise too much after you consume milk or if you have an unhealthy gut. What if you don’t know whether you can tolerate milk or not? The best approach would be to completely eliminate milk and dairy products for 30 days and then reintroduce one dairy product at a time to see whether you react to that product or not. For instance, you could start with clarified butter followed by butter, yoghurt and finally milk. Try to consume one item at a time for a week before moving to the next item. What type of milk are safe to consume when you have diabetes? If you choose to consume milk and you have diabetes, don’t waste your hard-earned money on ‘diabetic milks’ – these are nothing but marketing scams. Instead, choose full-fat milks that come from grass-fed animals (so you don’t get a not-so-nice dose of antibiotics and hormones in your milk) and that are preferably raw (unpasteurized). The next best choice would be full-fat, grass-fed milk. How much milk can you drink if you have diabetes? There is no clear-cut answer for this question since no two individuals with diabetes or insulin resistance will react similarly. The best way for you to find out how much milk you can safely consume is to test your blood glucose levels before you drink milk and 30 minutes afterwards. Keep in mind that insulin sensitivity varies throughout the day – in other words, if you like to drink milk in the morning and at night, make sure to test your blood glucose levels each time. Can you drink non-dairy milks if you have diabetes? It depends on the type of non-dairy milk. Let’s start with the non-dairy milks that can send your blood glucose levels on a roller-coaster due to their high carbohydrate content: oat milk, rice milk and any type of sweetened non-dairy milks. You also want to avoid non-dairy milks that contain ingredients you cannot pronounce or fillers. I also advise against soy milk since most of the soy in the US is genetically modified, highly processed and unfermented. It is true that many studies suggest that soy could have potential health benefits but many more indicate that soy is harmful for consumption. Why risk your health? Instead of soy, oat and rice milks, try full-fat coconut milk or almond milk – the natural fat these products contain will prevent your blood glucose levels from spiking. Of course, you want the unsweetened versions that are free from chemical additives such as sodium metabisulphite or guar gum. If possible, look for products that come in BPA-free cans or cartons – two brands of coconut milk you can select are Native Forrest and Arroy-D (the version that comes in cartons). Now that you know the basics, let’s move to commonly asked questions. Can I drink milk if I have gestational diabetes? It depends on several factors – check out the section ‘When consuming milk may not be a good idea’. Can chocolate milk give you diabetes? Diabetes type 2 is not caused by a single food or drink but by your overall lifestyle. This being said, sweetened chocolate milk can gradually worsen insulin resistance – the culprit here is not the milk but the tons of sugar added to it. 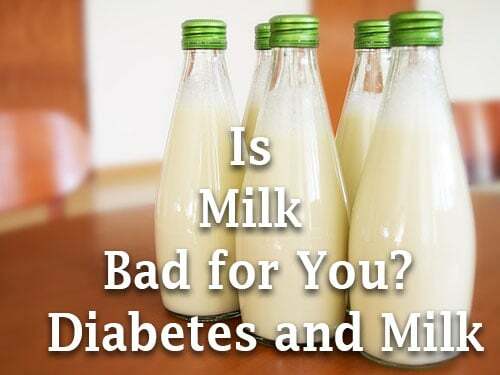 Can milk give you diabetes? Can you get diabetes from milk? Is milk bad when you have diabetes? It depends on how well you can tolerate milk – check out the section ‘When consuming milk may not be a good idea’. Can you drink almond milk with diabetes? Yes, provided that you drink natural almond milk that is unsweetened and free from chemical additives. Which milk is best for diabetes? Consider one of the options we have given. I cannot drink full fat milk because of acid what else can I do? I believe you can get used to and enjoy Rice Drink/Almond Drink within 7 days. If I were to drink cow’s milk now: would taste sour. I really love Vanilla Rice drink…your body will thank you, immensely. No one needs milk from a cow. It causes more osteoporosis than it prevents. Children should avoid puss filled dairy altogether. Almond milk, cashew kinds of milk, are great! yes. I agree 100% big dairy is big business, isn’t it? (including gov’t subsidies). Unscientifically: I can say….Since reduce protein and eliminating dairy: I have been off of Humira (for Psoriatic Arthritis) for 10 years. I suspect I was pre-diabetic also (and those symptoms stopped also). Many other aliments have cleared also: GR, hives, mucus build up. Dairy free is the most helpful health change one can make. This is coming from once 3 quart a day user. Plant milks are garbage. These are preferences of vegan sh*theads whose only only concern is the welfare of animals 1st. For the countless numbers of infants whose mothers can’t or won’t breastfeed them animal milks are the next best thing so long as the infant bodies are not intolerant. Real milk contains a plethora of nutrients not found in milk substitutes, like Retinol n Colostrum etc. What do ideological know or care for such things? Nothig !!! I was also wondering about that very same thing. They say all these autoimmune diseases related to milk yet I rarely drink milk and I still ended up with fibromyalgia, Diabetes with Neuropathy and Cancer. So you tell me. I feel the way you do, it’s ridiculous. Should I take my morning dose of insulin before a milky coffee or afterwards.